Although several 3-D house-modeling packages exist, and a couple are even on-line, nothing seems to work quite as simply as Sweet Home 3D. It's both a 3-D and 2-D layout tool, and it comes with a wide variety of pre-made furniture and window/door graphics to get you started. I was able to design a rudimentary living room in about two minutes (Figure 1), and that included installation time! 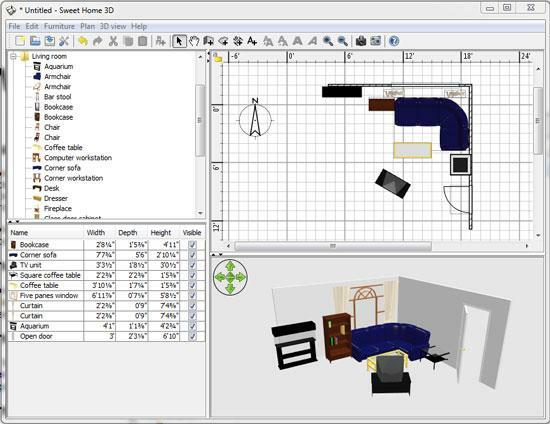 Sweet Home 3D is an open-source Java application that comes with a nice Windows executable installer. You might be thinking, if it's Java, won't it run on other platforms too? Well, yes, of course! It might not be as simple as the Windows executable installer to use it on OS X or Linux, but it's Java, so it's cross-platform-compatible. If you need to design a layout for your house, but don't want to haul furniture around to see what it looks like, I highly recommend Sweet Home 3D (http://www.sweethome3d.com).